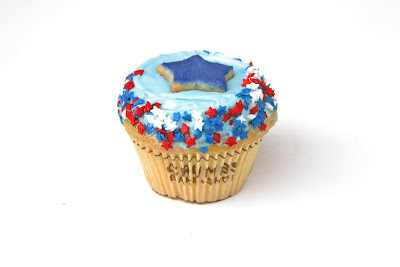 Crumbs is celebrating the start of the FIFA World Cup by selling a cupcake that shows their Team USA pride. This special limited-time Patriotic Cupcake is red velvet filled with chocolate ganache, topped with blue vanilla cream cheese frosting, and edged with red, white, and blue star sprinkles. A star cookie with blue fondant sits on top. You can also get a vanilla/vanilla or vanilla/chocolate cupcake with the same decorations. Team USA cupcakes are $4.50 each and $27 for a six-pack (with all three flavors). Red velvet with chocolate ganache filling?...sounds delicious! Might be worth the $4.50 price tag. 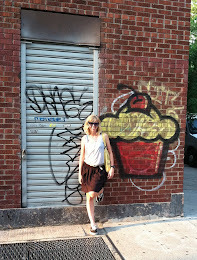 Know of any other cupcake shops with FIFA World Cup related cupcakes?